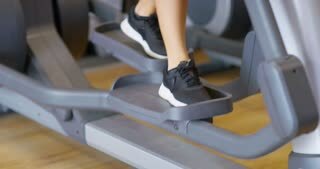 Young sporty woman training legs in gym. Athletic woman training her quads at machine press at gym. People, fitness and bodybuilding. Beautiful young sportswoman working out at the gym doing leg press exercise. Attractive fit and toned fitness woman training at sports studio using leg press machine. Motivation, bodybuilding. Woman using weight machine for legs at gym. Young woman flexing muscles on leg press machine at fitness center.